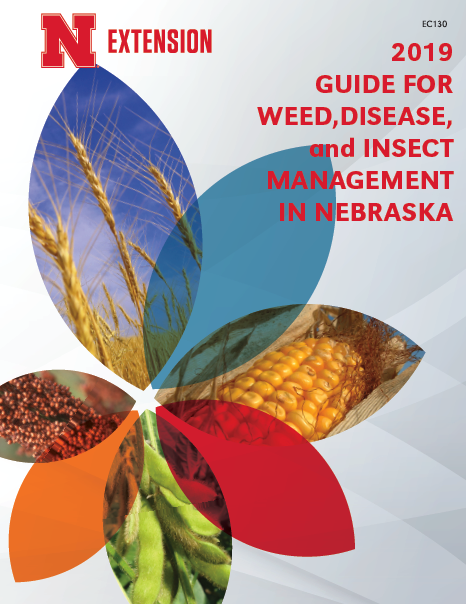 This 300-page guide is a comprehensive resource for current research-based information and UNL recommendations on weed management in Nebraska crop production, with special sections on fungicides, insecticides, and pesticide application equipment and safety. It includes detailed drawings and photos to aid in weed identification, as well as photos to aid in insect and disease identification. This 300-page guide is a comprehensive resource for newly updated research results and recommendations on weed management in Nebraska crop production. New this year is a chart on herbicide modes of action, tables on selecting sprayer nozzles for droplet size, a section on flame weeding, and expanded fungicide and insecticide listings. It includes detailed drawings and photos to aid in weed identification, as well as photos to aid in insect and disease identification. Weed Control for Noncrop Areas, including aquatic, CRP, ditches, roadsides, pastures, and turf. Product Dictionaries for herbicides, fungicides and insecticides labeled for use in Nebraska.